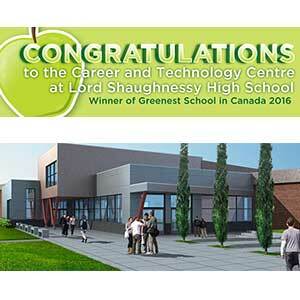 The Career and Technology Centre (CTC) at Calgary’s Lord Shaughnessy School has been named the Greenest School in Canada. The school received the award from the Canada Green Building Council (CaGBC) and the Canada Coalition for Green Schools. “This award is a tribute to the amazing work of passionate staff and students that make this school such a great environment in which to learn,” said Adam Robb, a co-teacher of the Energy and Environmental Innovations program at CTC. As the competition winner, the CTC receives a $2000 cash award to use for a green project and will be the official Canadian entry into the Greenest School on Earth competition. The latter is an annual competition the Centre for Green Schools puts on. Thomas Mueller, president and CEO of the CaGBC, said the CTC’s program demonstrated leadership and innovative thinking. The greenest school jury, composed of green building industry experts from across the country, cited the CTC for its Energy and Environmental Innovation program. The program actively engages students in all programs in the sustainability of the school. The CTC placed second in the 2015 competition. To win this year’s award, significant improvements were made to the CTC program. The students tended gardens and grew greens that were used daily in the culinary department and built aluminum frames for living aquaponics walls that they constructed, assembled and sold. They piloted a hands-on version of social studies, looking at historical and current events through a natural resources lens. They put together a student-run plan to develop an economic strategy to invest in mass solar installation. Their current proposal is now waiting approval. That would see 20 per cent of the Calgary Board of Education’s electricity come from solar. To put the strategy in place, 6.6 per cent of the roof space that the Calgary Board of Education owns would host solar panels. The payback period is an estimated 14 years. The students are also developing a prototype air quality tester to look at optimal levels of CO2 in classrooms, among other initiatives. Second place in the competition went to Argyle Alternative School in Winnipeg. The school scored high marks with the jury for their incorporation of Aboriginal culture and teachings, including art and sculpture, as well as strong environmental stewardship and leadership on the part of the students. In the area of leadership, the students have created a series of short documentary videos that they present to a wide variety of audiences to share their knowledge and spread sustainability education. The school’s documentaries have won a number of high-profile contests including ones sponsored by Manitoba Water Conservation, Crazy for Composting, Caring for Our Watershed, and both the Manitoba and the Canadian Councils for International Cooperation. The students have also led waste reduction programs, including a successful water conservation campaign, a composting program and community garden. Reynolds Secondary School in Victoria received third place. The jury said the school embodied “green building” in physical building changes and updates that extended its learning place to outdoor areas to achieve the health benefits of nature. Among other things, the school reclaimed its inner courtyard, planting both native species and food gardens. The provision of numerous picnic tables now sees students use the space for free time, lunch and before and after school. The students also run a chicken fostering program, a monthly recycling debt, and a “Green It Forward” program. Other sustainable initiatives include a food garden that partially supplies produce for a weekly salad bar program for staff and students; and low flush toilets, and lighting controls.